Chennai36 talks to Associate Professor Dr. Andrew Thangaraj on his life as a student and a Professor at IIT Madras. What were your memorable experiences in the institute? I was a student of Alakananda Hostel and enjoyed playing. I played in the 6-a-side hockey and 9-a-side cricket matches. The Schroeter matches between hostels used to be interesting. My time as a first year was memorable as I had to adjust to a new environment and was friends with a bunch of rowdy seniors. Second and third years were a bit more routine. Academics was challenging, in a department which expected a lot from the students. How were your experiences in Saarang and other events? It was called Mardi Gras for the first two years I spent at the institute, and then the name change to Saarang took place. Although I wasn’t a very regular participant , I enjoyed the events and was always around. I participated in the crosswords in my final year . Some faculty started Bharat Utsav, upset that students were not getting enough of Indian culture. I do not remember too much of it. Are there any professors who taught you then and are still in the institute? How did you feel coming back and working with the same people? Most of the professors who taught me in the department were still working when I joined the institute as a faculty member, although some have retired since. Professors Bhaskar, Ashok, Devendra Jalihal are some of the professors who are still here. Professor Aravind was my guide. Although we remember our professors as students, and they knew us then, they usually forget you in a few years. We change a lot after we finish UG, and as we do masters and PhD. The department functions in a very smooth manner. Although I was a student of many of the current faculty, I am now a colleague, and I don’t feel awkward calling my former teachers by their first names. They adjust easily to new faculty. Some of my students call me Andrew after graduating, but a few others still send me mails addressing me as “Respected Professor”. Who was there in your room before you joined, in other words who was your room father? I dont remember exactly. My first room was a lab before I joined. Professor Krishna Vasudevan was there in my current room and before that I think KRK Rao was there. How has the department changed since then? Today there is a lot of focus on research. Papers are very important now. In my time as a student here, there were perhaps 1 or 2 PhD students and a handful of Masters students in the communications section. Now there are scores of PhDs and many more MS students. What made you come back as a faculty member? Most of my close family is here, and I always wanted to come back to India. I think I was the only one in my close family who went abroad to study at that time. Even as a student I knew that I would come back. I was known among my hockey teammates as “Professor” even in my student life. What are your opinions on the various job opportunities now and the migration of engineers to non-core fields? During my UG days in the institute, jobs in India were not very attractive. However, in my final years, companies like TI, Wipro, TCS had started coming. Before that, it was difficult to find companies or organizations with a truly professional workforce in India. Only at that time, the high-tech and other IT companies were getting established. In my batch, nearly everybody applied for a Masters or PhD program. In a class of 70, about 50 applied, I think. Everyone from CG 6 – 9.6 would opt for further studies. Nowadays, the job market is completely different. There are so many companies out there. Everything is professional and you can do something worthwhile without getting into a bureaucratic mess. I feel the Major must be picked up after a year and the student must be allowed to decide the stream he/she enjoys, and not forced to take one. Now the JEE rank decides your subject, and students are forced into a department from day 1. I don’t think we can force today’s generation to do that. We had no choice as our society was different then, but now things need to change. Have you had the opportunity to visit your hostel? I don’t usually walk into my hostel, however when friends come, we like to relive old memories, so we stroll around the hostel corridors. The security guard doesn’t stop us. Hostel life is now definitely not what it was, since it is now the electronic era, with cellphones, Internet and I-pads dominating our everyday life. At that time, pastime was books, play and chatting endlessly with friends. You mentioned that you played in the 6-a-side match. Do you have experiences you want to recollect? We played a most memorable 6-a-side hockey match with Ganga Hostel in my third semester, we just somehow grabbed the lead, and defended as tightly as we could. At that time, P. Ramesh was the star player for Ganga in the game. It was an achievement for us to defeat them. But I never realised that I was contracting jaundice as I played the game. It overtook me the next day or so, and I had to go home for about 4 weeks to recover. But I came back and performed well, and I got a good CGPA that semester. So, things worked out very well. What is your message to students? Although clearing JEE and entering IITs is an achievement, I feel you mustn’t sit on it. You must challenge yourself further. There are many more things to do. You must pick one technical area that you like, it shouldn’t be a random selection, as what happens with the JEE merit list preferences.You need to master this one chosen area, and it is better to graduate mastering something even if your CGPA is low. There must also be something outside academics that you must improve at, any one thing, say at Saarang for which you prepare and excel at. Spend time on that activity as well as academics. 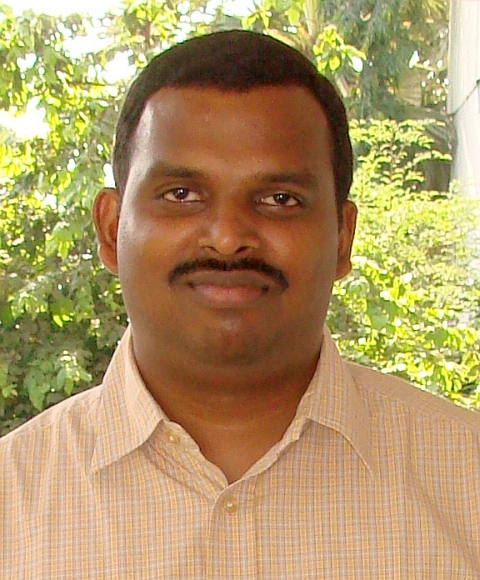 Andrew Thangaraj received his B.Tech in Electrical Engineering from the Indian Institute of Technology (IIT), Madras, India in 1998 and a PhD in Electrical Engineering from the Georgia Institute of Technology, Atlanta, USA in 2003. He was a post-doctoral researcher at the GTL-CNRS Telecom lab at Georgia Tech Lorraine, Metz, France from August 2003 to May 2004. From June 2004, he has been with the Department of Electrical Engineering, IIT Madras, where he is currently an associate professor.